This light supper dish combines a classic gremolata, which is a garnish made from garlic, lemon and parsley, with green olives to add a fruity tang. Cod fillets make a good base for the topping, but you could also use haddock or any other white fish fillets. Grate the zest from the lemon and place in a food processor or blender with the garlic, parsley, olives and a little seasoning. Blend lightly to make a chunky paste, then gently mix in the breadcrumbs. Preheat the grill to its highest setting. Cut the cod fillets in half to make 4 even-sized pieces. Squeeze the lemon and sprinkle the juice over the fillets, then season. Place the fish in a large, shallow, ovenproof dish. Grill for 5 minutes or until the fish has turned opaque. Carefully turn the fish using a fish slice, add the stock and grill for a further 5 minutes. Spread the gremolata mixture over the fish and grill for a further 3-4 minutes, until the topping is beginning to colour. Drain the fish and place on serving plates. Stir the yogurt into the juices left in the dish and season lightly. 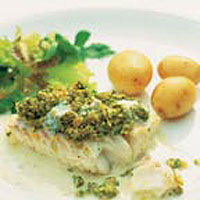 Spoon the yogurt sauce over the fish and serve with the new potatoes and salad. The cooking time will vary slightly depending on the thickness of the fish. Pierce the thickest area with the tip of a knife to check that it is cooked, and white and opaque throughout.